We had a great time at Ocean Blue. The Appartement is very nice and has Everything needed to enjoy the stay at Home. Highlight is the terrace with a great view and the nice breeze. Just Perfect to relax. The interior Design is high quality and modern.. and the bed. is very comfortable and Huge. Simon, the property Manager is a great guy .. thanks a Lot Simon for Everything. We would recommend the Appartement and will come back for Sure. Werden op vliegveld door Simon opgehaald. Meer dan voldoende handdoeken in appartement. Erg schoon. Heerlijk balkon om te relaxen cq te eten. Dicht bij vliegveld maar geen geluidsoverlast,. Grote inloopdouche. Mooi uitzicht vanaf terras. Klein zwembad met voldoende ligbedden op resort. Il nostro soggiorno a Ocean Blue Bonaire è stato fantastico. L'appartamento è molto bello, curato e dotato di ogni comfort. La doccia è ampia ed il letto molto comodo. La vista dal balcone è stupenda e rilassante. Simon è una persona squisita ed ha saputo darci un ottimo benvenuto sull'isola di Bonaire, abbiamo apprezzato la sua disponibilità ed i suoi consigli, la comunicazione è stata facile nonostante il nostro scarso livello di inglese. La struttura è comoda sia per il centro città che per la spiaggia, ciononostante consiglio di noleggiare un' auto per riuscire a scoprire meglio l'isola. Sotto l'appartamento c'è ampia disponibilità di parcheggio privato. Piscine que pour nous pendant tous le séjour. Vue sympathique sur la Marina. Cecile a été tres agréable et nous a laissé la demi journée supplémentaire pour attendre notre vol. Top service van Cecile, transfers van en naar luchthaven en een kapotte airco werd zelfde dag nog gemaakt! Groot appartement met heerlijk balkon, alles wat je nodig hebt is aanwezig. Geen overlast van de nabijgelegen luchthaven. La localisation géographique, la qualité de la literie, l'équipement très complet de l'appartement, la terrasse avec vue dégagée et surtout la qualité de service proposée par Cécile, hôte très sympathique et toujours disposée à rendre service. Lock in a great price for Ocean Blue Bonaire – rated 8.8 by recent guests! 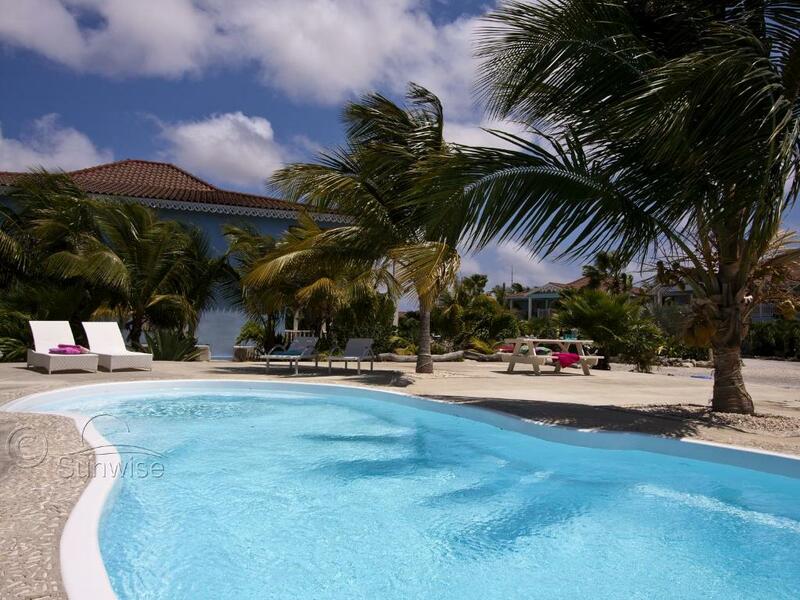 The Ocean Blue Bonaire apartments are located in Kralendijk, a 10-minute walk from the beach. They offer free Wi-Fi, free parking and a furnished terrace with bay and garden views. Decorated in a luxurious contemporary style, each Ocean Blue Bonaire apartment features 1 bedroom, 1 bathroom and a lounge with cable TV. The well-equipped kitchens include an oven, microwave and coffee maker. The Ocean Blue’s tour desk can provide information about activities, including watersports and fishing. Restaurants and supermarkets can be found within a 5-minute drive. Kralendijk´s city center is located 1.6 mi away and Bonaire Flamingo Airport is just 1,650 feet from the property. 뀐 Located in the top-rated area in Kralendijk, this property has an excellent location score of 8.0! When would you like to stay at Ocean Blue Bonaire? This spacious apartment features a furnished living room with a seating area and a TV. The fully equipped kitchen has a dishwasher, microwave oven, ceramic hob and fridge/freezer. The master bedroom with private bathroom has a king size bed. The bathroom has a shower and a sink, a separate toilet and bidet. Through a sliding door in the living room you can enter the splendid terrace. The terrace provides a gorgeous view over the water and is very conveniently located to the wind. House Rules Ocean Blue Bonaire takes special requests – add in the next step! Ocean Blue Bonaire accepts these cards and reserves the right to temporarily hold an amount prior to arrival.